The Primos Dogg Catcher is a compact and highly portable electronic call that boasts simple-to-use features and great value. We have spoken at length about what a great and historic brand Primos is on our site. Will Primos first started building calls in 1963 and his brand has grown to be in that top tier of predator call companies, with the likes of FOXPRO and ICOtec. The Primos brand certainly deserves its sterling reputation in the hunting world. The Dogg Catcher is an excellent, great-value-for-a-low price addition to Primos' awesome product line. The Dogg Catcher comes in at a sub-$80 price on Amazon, which is consistent with the best entry level predator calls on the market. This unit is made with the high quality composite moulded material Primos prides themselves on, and is made for success in bad weather conditions. This is a great unit for the predator hunter who’s just getting started and wants great functionality and features at a low price. For a more advanced, more expensive unit from Primos, we recommend the Primos Alpha Dogg (click to see our review). Electronic calls within the same brand share consistent base functions, and Primos is no different. The Primos Dogg Catcher is the baby brother of the Primos Alpha Dogg and Primos Turbo Dogg, both of which have MUCH higher price tags and more features to boot. For example, both the Turbo Dogg and Alpha Dogg are programmed with more than 3x the sounds of the Dogg Catcher. They also feature hunt sequences by Randy Anderson, whereas the Dogg Catcher only has individual Randy Anderson calls. Hunters new to e-callers shouldn't be concerned with having a huge library of calls or the ability to run 30-minute pre-programmed hunt sequences. They're largely unnecessary and you won't learn anything or become a better hunter by just running pre-programmed sequences. 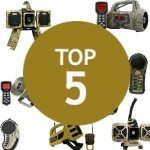 Because it is simple to use and very inexpensive, the Dogg Catcher is a great entry-level choice for any hunter. Why Buy the Primos Dogg Catcher? 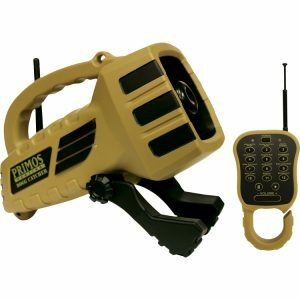 The Primos Dogg Catcher is Primos' entry level electronic call. This unit comes programmed with 12 different predator calls by hunting guru Randy Anderson, so you know you're getting quality, albeit in a smaller library than a $200 or $300 electronic caller. It's a true steal at its sub-$80 price tag, and will get you started off on the right foot if you're new to e-calling. 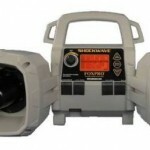 This unit weighs only 2.5 lbs -- lighter than most FOXPRO units -- and plays MUCH louder than any mouth call. While testing this unit, we were amazed not only at how compact and light it is, but also how loud our calls were in open fields. There are plenty of e-callers that really struggle with loudness (we haven't bothered featuring them on our site), but at sub-$80, this baby is surprisingly LOUD. 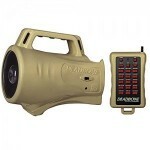 The Primos Dogg Catcher's single high-powered horn speaker delivers volume that would be satisfactory for almost any hunt. 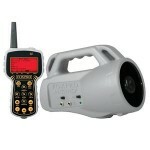 This unit can play two sounds simultaneously, which is a big benefit for newbies and pros alike. One of the best ways to improve as a predator caller is to learn from mixing different sounds -- i.e. "learning to speak the language." With these facts in mind, you're getting a unit with awesome value in the Dogg Catcher. Randy Anderson is one of the biggest names in hunting today. Dozens of years of predator hunting have taught him how to replicate the language of coyotes. He knows what, and when, to use each type of call. He's designed a series of calls, available on the Primos Dogg Catcher, to help hunters across the USA to learn to speak the coyote's language. 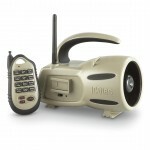 The Primos Dogg Catcher is well-made and has all of the basic features required in an entry level e-caller. At a sub-$80 price, this unit is a ridiculous steal, if not just to have a low-cost back-up handy. It weighs less than 3 lbs, and can be controlled from 150 yards away. With its 12 different calls and powerful horn speaker, this electronic coyote call should satisfy the needs of most hunters. Although you can't program your own calls on to the Dogg Catcher, this feature is not included in any sub-$200 electronic call, so it isn't fair to expect this in an entry-level call. For more features, including a larger call library and programmability, check out the Primos Turbo Dogg and Primos Alpha Dogg.